These Japanese Style Coconut Custard Buns taste really superb. The bread texture is soft and fluffy and the filling is full of coconut aroma. I have been addicted to making bread recently, with the tangzhong (湯種) method of course since I found it’s easy to manage and the end products were wonderful even in my first attempt. Even better, the bread can be kept soft for a few days. What else can be better than baking homemade bread that my family likes? So I keep baking and baking, even on a day with a little accident happened…. These coconut custard buns were baked on the day when my finger was cut and right after it stopped bleeding. The dough had been proofed for enough time, custard prepared and chilled in fridge. An unexpected bleeding didn’t hold me off. I used only one hand to wrap the fillings and pop all those cute little buns in oven. It’s really a new challenge to me, the first time, and I hope it’s the last time too. Well, it’s simply because I didn’t want to waste anything that was already there. The buns looked good enough, tasted as expected, very soft and fluffy. See....the texture is so soft inside, really fluffy! Combine softened butter with sugar. Add egg, stir well, then followed by desiccated coconut. Combine all ingredients well. You can make the filling while waiting for the 2nd round of proofing completed. Or you might like to prepare in advance, cut into 6 equal portions, place in fridge until you need it. If they are chilled too long, place them in room temperature for a while before use. That would be much easier to handle. 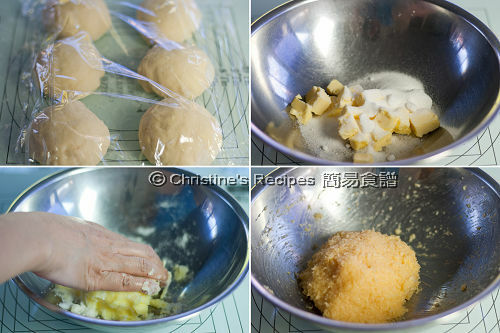 Please refer to the previous recipe to make dough with tangzhong (step 1 to 3). After completing the 1st round of proofing, double in size, transfer dough to a clean floured surface. 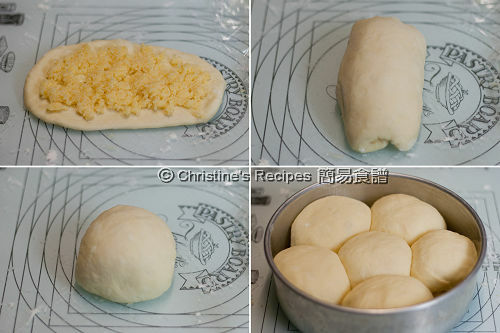 Deflate and divide the dough into six equal portions. Knead into ball shapes. Cover with cling wrap, let rest for 15 minutes. Roll out each part with a rolling pin into an oval shape. Place custard filling evenly onto the surface of dough. Roll from top to bottom to enclose the filling. Flatten dough with pin. Again, roll from top to bottom. Knead into a ball shape. Repeat this step of rolling and wrapping fillings with the rest of your dough. With seals facing down, place the six balls into a greased baking tray or lined with baking paper, covered with cling wrap or a wet towel. Leave it for the 2nd round of proofing, about 45 to 60 minutes, until double in size. Brush whisked egg on surface of buns. Sprinkle sesame seeds if you like. Bake in a pre-heated 180C (356F) oven for 35 minutes, or until golden brown. At about 5 minutes before removing from oven, brush syrup on the surface of buns. Transfer onto a wire rack and let cool completely. Here's the picture of my fan who baked these buns right away after reading my recipe, then uploaded it on my fan page here The look of her buns looked exactly like those sold at Hong Kong bakery shops. Bread making is fun and addictive. Take cautions, mates. Here are the great shots and end results shared by my friend's daughter, Elain. Christine, these buns look simply amazing and I have always had a weakness for anything coconuty. I have not been baking a lot, but these beauties could change that for me. what great bread...looks so light and delish!! Wonderful looking buns. Fantastic recipe to produce such fluffy buns, bursting with filling! They look fluffy indeed. And good to see you post again. The buns look so puffy and soft. Yum!!! Lovely buns, look so soft. I love to eat straight from oven. Yes, I feel like "tearing" one bun from the lot now and eat it! Looks really soft and delicious. I think I can eat a few in one sitting :D I love the filling. I love the photos and your comments.When it comes to the ingredients...it would be more helpful to cooks such as me with no scale if you offered a conversion from weight to cup or teaspoon measurements. I know measuring my weight is more accurate but I'm still in cups and teaspoons mode. Thanks for your love of my photos and leaving precious comments. As for this recipe, I can’t convert to cup or teaspoon measurements. As you can see those ingredients listed here are in very small amount, a little bit more or less will change the texture of the bread significantly, since all ingredients in this recipe are calculated in a balanced formula and should be weighted accurately if you really want to make perfect buns. It’s not the kind of dish like stir-fry, stew or cup cakes that you can freely adjust the amount of some ingredients as you like. Lovely looking! I really want to try this one out.. I love custard and coconut.. this must be good! wow these look wonderful would love to try one! I used to eat these buns when I lived in NYC... they were awesome and I can't wait to try them out! Do you have the recipe for filling used for Polo buns? They're an eggy filling - I was wondering if I could use the same filling you have here but omitting the coconut. Any thoughts would be appreciated! The buns with the fillings look so good, scrumptious! Hi Christine! I love the way the bread looks and I really have to get moving to make this dough after the gorgeous recipes I've seen. It is so versatile! Really like the idea of tangzhong! I don't think my last comment got through. Please forgive me for being dense, but I have trouble understanding this part of step 3: "Roll out each part with a rolling pin into an oval shape. Place custard filling evenly onto the surface of dough. Roll from top to bottom to enclose the filling. Flatten dough with pin. Again, roll from top to bottom"
I hope you can help me clarify it so that I can attempt this recipe with a bit of confidence. Just a note to say thank you very much for your blog. I have gaind a lot of cooking knowledge and benefited a lot from your amazing blog. I really like your recipes, especially this soft and fluffy bread. I have never failed whenever I tried your recipes. I also tried this Japanese style coconut custard buns this weekend, it was a big success!!! I've seen your link to the photos you took, very clear that you've got the idea of how to wrap the filling inside the dough. BTW, concerning wrapping filling, there's no right or wrong way. Take it easy. The main idea is to spread evenly and seal the filling inside. That's it. Glad you liked my recipes. Congrats on your success of baking buns last weekend. I clicked to your blog and saw your photos of fluffy buns. Great! This is Sau King's daughter Elaine. I've blogged about our bread making experience. Your buns look great and fluffy! Love them. These buns look AMAZING and I can't wait to try them. Is this recipe suitable for using a breadmaker to make the dough? Yes, this recipe is suitable for using a breadmaker to make the dough. Perfectly good. These little bundles of love look delicious, too bad I am a horrible cook and I think that if I make them, I will probably ruin them. Love the pictures on this post. This looks fabulous and I would love to give it a try. Is the yeast in your recipe the dry type (so will it need to be dissolved in water beforehand)? This recipe yields for instant yeast, that doesn't need to activate beforehand. But make sure it doesn't expire. I was wondering if I could post your recipe on my blog, with credits to you of course. Also, if I can, can I change some of the directions or no? Thanks for this awesome recipe! My whole family enjoyed making this bread. Glad that you like this recipe. You're welcome. You might like to share how you went about baking this bread (your way of making this bread) with a link back here to this original recipe. That's the way we'd like to share ideas, know more new ways of cooking in order to broaden our experiences. I can't wait to see your post. Hi Christine, I finally finished the post and here it is. I got these coconut honey buns once from wongwong bakery in Manchester (UK) and they were sooo soft and absolutely delicious. Since then I've been looking for a recipe for them which is very similar to the one i had, and i think this is it!! I'm so excited, cant wait to try it out especially with the tangzhong method! Will post! Just wondering did you use unsalted butter for the filling? Also, did you double the filling ingredients in the picture above, because it looks to be more than 15g of butter in the pictures? I followed the filling recipe, and after dividing it into 6 portions, each portion weighed around 11g. Thanks. I made double size of the filling at that time I took the pictures and reserved some for other dessert. You can adjust the amount of the filling and put as much as you like. I tested the outcome best suits my family. Hi Christine these look fantastic, do you by any chance have a recipe for honey buns? Sorry, I don't have the recipe you're looking for. I love these buns so much..I bought them almost every Sunday from BreadStory...They tasted so...soo...buttery and coconut-y...ahh...mouthwatering. I'm gonna bake this! Hi Christine,i have try this recipes.Is so good,thanks for sharing. 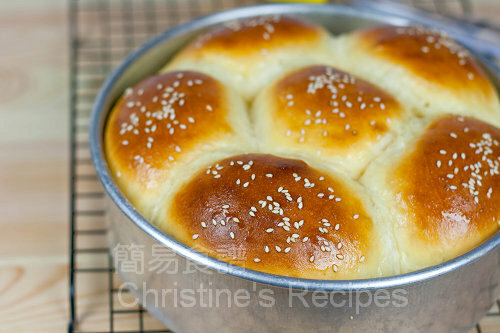 Hi christine ,do you have custard bun recipes? 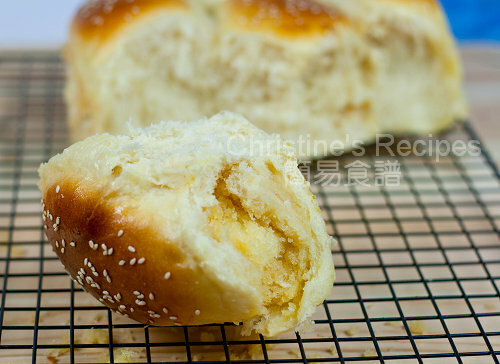 Sorry, I don't have custard bun recipe at the moment, but have coconut custard buns, see if you like it. It's whisked egg, without the shell. Break one large egg or two small eggs, lightly whisk it, then measure out 56 grams. 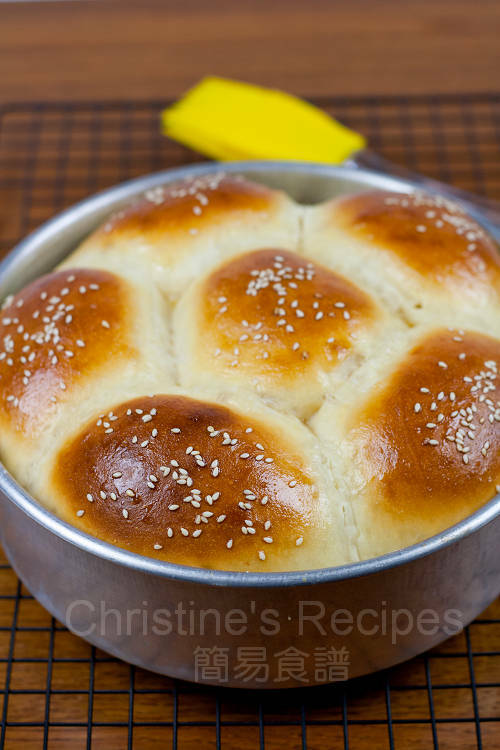 Oh my goodness - fluffy Asian bread! My absolute vice! Christine, does the filling in these buns taste like Hong Kong cocktail bun filling? Thank you, you amazing baker AND cook! Yes, they taste really like those “雞尾包”. You can shape the dough in oval shape, sprinkle some sesame seeds. There you go. Thank you for your love of my recipe. When it comes to baking this kind of soft and delicate buns, it's better to measure all ingredients in grams, because it'd be more accurate and have more quality control. Thank you for your thorough instruction and lots of wonderful recipes, from which I am greatly inspired. I made the milk bun today with custard fillings, they come out great soft and fluffy but I think they remain smelling of yeast. Could you prescribe some medicine for my dough please? I will search for a scale, thank you for suggesting it :) I think it's of more importance now. Hi Christine, This is my second attempt using the tangzhong method. The bread came out just as soft as the first time. Very nice and texture was good! However, the custard filling didn't seem substantial compared to the amount of bread. I think next time I'll add more (personal preference..hehe). Also, I subbed coconut with cranberries...yum! I think I'm addicted to tangzhong. :) Thanks again. If too much yeast is added or the dough was proofed for too long, the yeast smell will develop. Try to decrease a bit of yeast next time and see how it goes. Great idea of replacing your favourite fillings. That's why I put the warning along side with my tangzhong recipes. It's very addictive. Good for your family though, they can enjoy your soft and fluffy breads. Christine, how many coconut buns can you make out of the whole recipe (for 2 loaves)? I'm not sure whether to divide the dough into 6 or 12 pcs. Thanks. Depends on how big your buns are. I made six large buns. I used instant yeast and put in in my oven for bread proof( my oven has this feature) but it take at least 3 1/2 hours to get to double the size of the dough. But if i active the yeast with warm water and sugar it only takes 40 minutes to 1 hour for 1st proofing. Is it something with my instant yeast? cause I don't like the hazzle to activate the yeast. Please advise. Normally, instant yeast doesn't need to activate before mixing with other ingredients. Hmmm...It's interesting. But it's still no harm if you hydrate it with lukewarm sugar water first. Would you test with another brand of instant yeast? when you place the buns in the tray, do you put them close together or a little apart? since they need to double in size.